In this article I’ll show you one way to eliminate the ugly green color casts on skin tones. It is also a review of sorts for the Minus Green Filters found in the Lee Zircon range of filters. List of sponsored/free gear: The Lee Zircon Pack was given to me free of cost by Lee reps at Broadcast India in 2015, but not for review. They were just giving it away. What is the “green color cast” or “spike”? The terminology isn’t important. Some LEDs, due to their spectrum, cause human skin tones to take on a slightly greenish hue. With poor spectrums the green hue is very obvious, as it pervades the entire scene, not just skin tones. But with most LED fixtures for cinematography, it’s hard to see the color cast because it mainly affects skin tones more than other colors. The effect is subtle, and is easy to miss on camera. Watch the video below to know more about it. I have not used the Yuji bulbs for this test. Important: No filter can completely eliminate the problem and reproduce a spectrum similar to sunlight or tungsten halogen. If you want that kind of color response, shoot with those sources. Here’s a chart that summarizes the white balance readings from various filters. Camera used was the Sony a7S II in Rec. 709 color space. Observations were made with the DSC Labs OneShot Chart. M and G refer to magenta and green. Most cameras can custom white balance and can make adjustments for the green-magenta axis. When such a correction is done, it applies to the entire image, not just skin tones. The last reading for the CN-60F is in red because it actually changes the white balance of light that was perfectly fine to begin with, even though it’s the weakest filter. Obvious takeaway being you shouldn’t use the filter if it’s not necessary. You can see most times the camera compensates for the magenta shift with a green shift. That’s the limitation of white balance, a video of which I’ve made earlier. You can see most of the time adding the 805 hardly makes a difference. The small change it produces does not register very well. Note: All images are screenshots compressed as JPEGs. The colors are never going to be exactly what you see on Rec. 709 monitors, however the vectorscope should tell you everything you need to know. Note: The first image is without any filter or compensation. The second is with the 802 filter, and the effect is subtle. 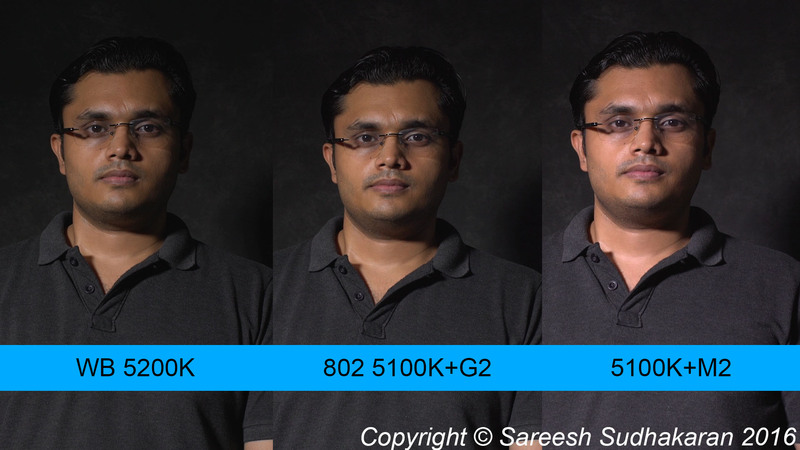 The third is just white balance compensation in the opposite direction. The 801 clearly overcompensates to the magenta, while the 802 is probably the best overall compromise. This is what the first test has shown as well. To compare my results with the data Lee has published, click here. However, even though these gels help they are not replacements for full spectrum sources. Overall, because the price is low and the life expectancy of these gels is high, they are absolutely worth it in improving to reduce the color casts on skin tones. Important: Obviously, you shouldn’t just blindly throw on the 802 or whatever without testing it thoroughly on your own lights. Color is a subjective thing, and what I find acceptable might be unacceptable to you, and vice versa. Remember, only I know the real color of my skin. Pick your poison.